Patients who arrive at the emergency department (ED) in moderate or severe pain are often given intravenous morphine, administered by a nurse. This is safe and works in the short term but is demanding of nursing time, particularly when repeated doses of painkillers are necessary. One potential solution is for patients to administer their own pain relief using a patient controlled analgesia (PCA) device. A PCA device is a syringe usually containing morphine that can be connected to a drip in the patient’s arm, which allows the patient to deliver their own pain relief by pressing a button. PCA devices are commonly used in other areas of the hospital (typically after an operation), but are not usually used in the ED. Until now there has been little evidence to support the use of such a method in the emergency setting, and no previous study has assessed its effectiveness in the hours following admission to the ward. Two randomised controlled trials carried out by NIHR-funded research teams from Plymouth Hospitals NHS Trust and Plymouth University Peninsula Schools of Medicine and Dentistry, and managed by the Peninsula Clinical Trials Unit at Plymouth University, have for the first time addressed this ‘evidence gap’ by assessing patient controlled analgesia in the ED and following admission in two clinical circumstances – patients with pain from traumatic injury and patients with non-traumatic abdominal pain. The studies were conducted in five NHS hospitals in England, and were supported by funding from the National Institute for Health Research (NIHR) Research for Patient Benefit programme. The results of the trials, published today, 22 June 2015, on-line in The BMJ, show that patient controlled analgesia is statistically and clinically superior for patients with non-traumatic abdominal pain when compared with standard methods of pain relief delivery. In patients with pain from traumatic injury, the results were more equivocal and it remains uncertain whether PCA offers any advantages to this group. Both trials worked with a patient sample of 200, all of whom presented with moderate to severe pain and were expected to be admitted to hospital for at least 12 hours. The routine care aspect of both trials was based on best current practice using different modes of analgesia according to NHS trust analgesia policy. The difference was marked in the trial relating to patients presenting with abdominal pain, with PCA users reporting an average total pain score of 35.3 compared with 47.3 for those receiving usual pain relief. The other trial, involving patients with pain from traumatic injuries, showed that total pain reported by those using PCA and those treated via usual pain relief methods were similar. Those using PCA reported an average total pain score of 44, compared to 47.2 for those who did not. There were interesting, small yet clinically meaningful, secondary results from the studies. For example, patients in the trauma PCA group were almost twice as likely to be very or perfectly satisfied with their treatment compared with patients receiving routine care. 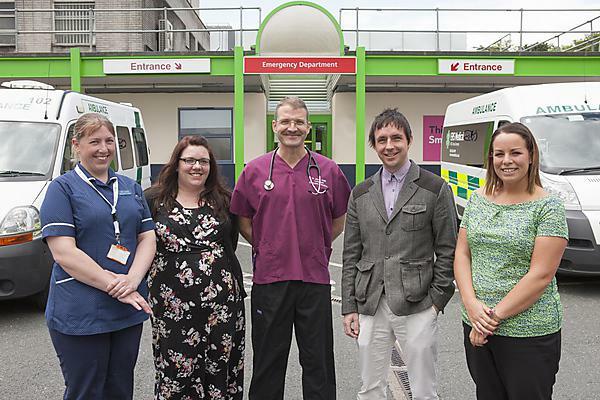 Professor Jason Smith, Consultant in Emergency Medicine at Plymouth Hospitals NHS Trust and Professor of Emergency Medicine at Plymouth University Peninsula Schools of Medicine and Dentistry, led the studies.